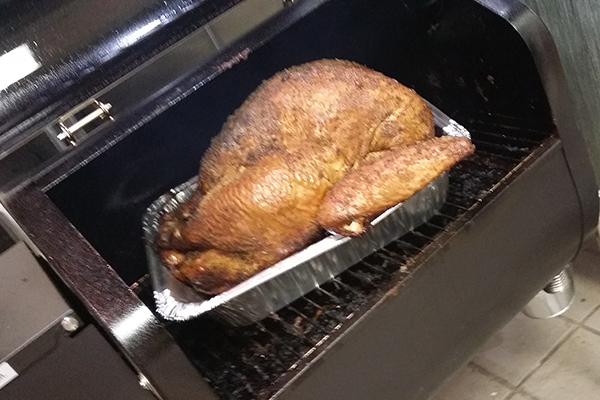 Chef John joins us again, this time with a beautiful smoked turkey. Everyone has their favorite turkey recipes make sure to add this one to your collection. Clean and rinse the turkey and pat dry, be certain to remove the neck, gizzard, heart & liver. May discard or place in a small sauce pan and create a broth for use in other dishes.In a large bowl combine all spices and brown sugar mix well. In a pitcher or bowl combine vinegar, sugar and liquid smoke, stir well and set aside. Using a 50/50 mix of Premium Fruit Wood and Premium Texas Blend Pellets, load the hopper and pre-heat your GreenMountain Grill. After the required 12 minute pre-heat cycle set the GMG temperature via your smart phone and/or temperature control unit to 335 degrees. Using the spice blended with sugar, rub down the turkey generously with the spice rub inside and out. Place the turkey breast side up an all vents on full open mode, once the Green Mountain Grill has come to temperature, inside the GMG. Close the main unit door and allow the turkey to smoke and cook for 1.5 hours at 335 degrees, after 1.5 hours reduce the temperature on the unit to 195 degrees and continue to cook for an additional 6 to 7 hours or until the internal temperature at the thickest part of the bird reaches 165 degrees. Every 40 to 60 minutes using a basting brush, baste the turkey with the Vinegar Mixture (aka PIG Juice). Need more “PIG Juice”? Make more! It’s awesome not only on Turkey, but ribs, pork, sausage, etc. Once at temperature remove the bird from the smoker, cover with foil and allow to rest for 30 to 40 minutes. After resting the turkey is ready to carve. Use care when carving and know that with some simple easy to follow carving techniques you canhave an awesomely prepared Smoked Turkey for you and your guests or to carve for lunch meats. Every protein comes automatically with a built in road map for carving, from birth. Take a good look at the protein and follow the lines that are there, you’ll have an awesomely carved meat when you are comfortable in knowing, carving is really pretty easy!